For those wanting to experience Incan history and aren’t planning to undertake the traditional 4/5 day trek through the Inca trail, then the other options include hoping through the modern day colonial towns that were integral routes to Manchu Picchu. For most, the journey starts in Cuzco and the final destination is Manchu Picchu. Having made the journey to Manchu Picchu we also wanted get a flavor of the Sacred Valley. Sadly having witnessed the splendor of Manchu Picchu, the awe of the ruins in these town paled in comparison. My goal was to get a sense of the charm of these small colonial towns. We thought the hoards of tourists in Manchu Picchu were annoying, well sadly these bused masses made it somewhat unbearable to traverse around these towns. Guided tours pass through constantly, providing a very shallow and curated tour of the towns and the surrounding ruins. Thankfully we got to spend a bit more time to roam around and see a little bit beyond the ruins. Otherwise, most tours stop for a few hours and then move on to the next town. In our stop we visited Pisac, Oyantaytambo and Chincero. The perfectly manicured agricultural terraces in Pisac were beautiful. To see the precision and science that went into their creation and how each was specifically utilized to grow different crops. Oyantaytambo was the busiest town. As the starting point of most Inca Trail expeditions, it definitely resembled a packbacker dive spot. In every corner stood pizza restaurants and tourist agencies. All in all the visit through the sacred valley made for some great people watching activities. With the mix of tourists from all around the world and souvenir markets all over these towns, it was interesting to see the haggling process and the interaction in general. It was also great to get a sense of how large this ancient empire stretched. If one has the time, I would definitely recommend straying away from guided tours and exploring these towns at a more leisurely pace. I realize that the heading on this post does not do these amazing locations justice. With limited time and realizing that I had to tone down my adventures due to knee injury from a few years back, unfortunately I could not handle the intensity of the full Inka Trail trek or it’s more wilder version, the Jungle Trail. Having resigned myself to this decision, I did not want to feel fully defeated and I could not accept seeing Manchu Picchu from the relative comfort of train and bus. This is one place in particular,where I felt that I had to earn my entry. I for one am a fan of solo travel and in instances like these it was relatively easy to find trek mates who wanted to go at my pace. I met another solo female traveler who stopped by the language school for 2 weeks as she traversed South America. She too having suffered serious injuries in the past that left her hip/knees in bad shape, could not take on intense hikes but did not want a “free ride” to Manchu Picchu. So that settled it, having found a trekking partner, we set out to find the best means of getting some moderate trekking, while realizing the limitations of our bodies. With tour agencies and touts aplenty around Cuzco, it was a headache to sift through and find a decent agency that won’t over charge and provide basic services. The takeaway from this research was to find out hidden costs, what packages actually include (transport, lodging, meals, if so, how many meals, and equipment rentals). Thankfully, my trek-mate Alli did most of the legwork and haggled for a great deal. We headed off on an early morning bus from Cuzco to Hidroelectrica. From there were trekked to the town of Aguas Calliente. This short trek was a breeze and at this point, I was feeling confident that the remainder of the trip will not be as bad. I didn’t realize what was in store. After a few hours of rest we eagerly got up at 4:15 and walked out-of-town to cross the bridge and begin the hike up to Manchu Picchu. Our adrenaline rush was quickly squashed when we realized the gates to cross the bridge and enter the national park do not open until 5. So we moped around, half asleep disappointed that we can’t just get on with our trek. Finally on the trail, I quickly realized how out of shape I was. Despite being reasonably fit, and using a bicycle as my primary mode of transportation, I was quickly humbled by the steep, uneven steps and high altitude of the trail. I nearly puked, despite having no food in my system. Despite the arduous climb, after reaching the top, the walk around Manchu Picchu was well worth it. It was well worth it to make it up to Manchu Picchu before sun rise, to witness as the veil of fog lifted to reveal spectacular views of the ancient empire. After a one hour guided tour that gave a bit of insight on the historic site we ventured on our own. I realized that if I were Peruvian, I would be annoyed and disappointed by the portrayal of these historic ruins. Much of the credit is given to Yale Professor for “discovering” the site. Little mention is noted that an 11-year-old boy guided him to this location, so clearly many people in the area knew of its existence. As the hoards of buses started to arrive, the site quickly became crowded. From there we decided to hike up to Mount Manchu Picchu towards the Sungate, which is the trail that is used by most trekkers on the traditional Inca Trail to enter the ancient city. It was nice to escape the crowds and the view was spectacular. The views were overwhelmingly beautiful and I was left in awe of the mite needed to erect this ancient city in such an isolated and difficult terrain. The climb back down to Aguas caliente was equally difficult, given the late afternoon heat. bottom line, despite the express trek… the trip was still simply spectacular. I touched down in Cuzco, hoping to take some Spanish classes and take in the history of this city and its surroundings. Having picked up conversational Spanish many years ago in my travels across Uruguay, Argentina and Chile, I was forever marked with the distinct accent, primarily the insertion of “shhhh” for “y” and “ll” sounds. Killing two birds with one stone, I settled on Cuzco to get some formal Spanish classes and some trekking. Hoping to get the most of out of my 2 weeks, I opted to stay with a host family. In retrospect that was probably the best decision I made. Despite my reservations, it was also a really great learning experience. My initial interactions included a lot more gesticulation than actual words as I racked my brain for words to express my thoughts. It was frustrating as I pieced together and mentally translated my sentences, words in other half-learned languages would pop up instead, eventually drawing a blank. Thankfully within a few days my vocabulary was quickly coming back. Having come from Quito, another city with relatively high altitude, I naively thought I could quickly hit the ground running once in Cuzco (around 3,500 m above sea level). To my surprise, I was rudely welcomed with “Soracha” (altitude sickness). That was my cue to take it easy and sleep for nearly 16 hours to acclimate. Some cocoa tea helped ease the transition as well. 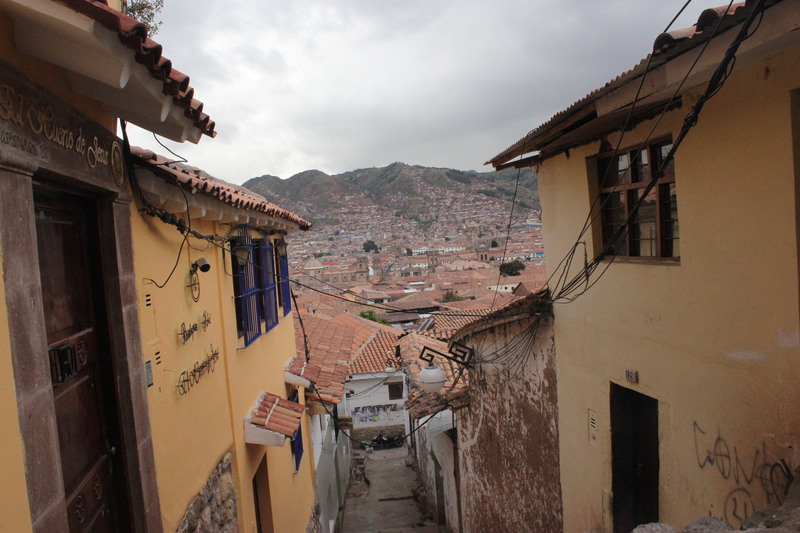 The city of Cuzco, stands as a stark reminder of Spanish conquest. The ancient Incan city was dismantled to pave way for Spanish colonial town. 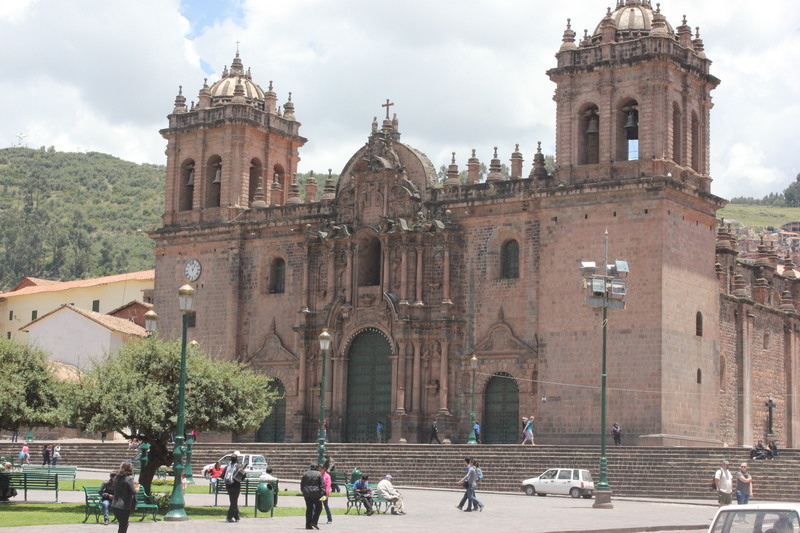 An ornate church stands atop the ruins of each Incan temple or sacred sight. The narrow cobblestone streets and remnants of impeccably built walls stand as haunting reminders of the capital of the Incan empire. The city radiates from the Plaza de Armas, which was brought to its knees during an earthquake in 1950s, surprisingly Incan structures that could not be destroyed by the Spaniards stood their grounds as the city crumbled from the powerful tremors. Walking the streets of Cuzco, I was left thoroughly conflicted. It was evident that the vast majority of those living in the city made a living of some sort of tourism related trade. Women, overly-dressed in traditional dresses totting dressed up sheep or llamas posed for a string of visitors in exchange for a few pesos. At every corner, hawkers pushed flyers in your face about tours, restaurants, treks. I was thankful for the tranquility for my host family’s house, where it was a bit comforting to discern from the tourist traps and have genuine discussions about Cusquenan life. During my stay, I roamed around the city in the few hours of free time beyond my all day intensive Spanish classes. I quickly found my way back to the Cocoa Museum for a lovely cup of hot chocolate or their amazingly decadent brownie. Exploring the neighborhood of San Blas was also a highlight. Having to climb an endless amount of cobblestone stairs, and being thoroughly winded at the top is worthwhile to visit the many art galleries and take in the amazing panoramic view of the city. Despite the outpouring of tourists around the city, wandering the small alleyways, I got to take in the charm of this city. I was definitely quite the unconventional tourist around these parts. I attracted a lot more attention from Cusquenans. It helped me start many friendly conversations. It seems that hijabi-clad, black-arab women are not their everyday type of tourist. I did not have a single disappointing meal throughout my stay. Cooking at home with the family was wonderful, and getting to explore so many new ingredients. I was not brave enough to try cuy (guinea pig), although a few friends that I had made during my stay raved about it. As an added bonus throughout my stay, I picked up a new knitting stitch, that the grandmother at my host family taught me. All in all, despite the two weeks, I felt that it was still too short. I was just beginning to scratch the surface and find out what makes this city truly tick. Peru: La vida Andina, a set on Flickr.